If you aren't already convinced that Portugal is a travel bargain worth a visit, you will be. And you can't really say you've seen Lisbon without seeing Belem. If much of Portugal is explained by its explorer past, then this is the district to find that history. There are several important sights from Portugal's golden age of explorers. It was from this district that many of the great Portuguese explorers left to "discover the world". That was how we got out there, but times are changing and more often now you'll be on one of the new super fast trams. It's the line #15 that will get you out to the Belem district which is about four miles from downtown. The Monastery of Jeronimos (Mosteiro dos Jeronimos) is probably the most impressive building in this district. 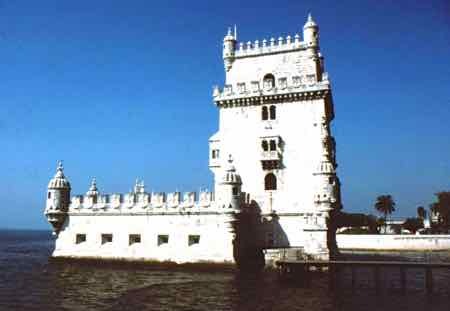 It is said that Vasco Da Gama slept in a tent and prayed on the site of this building before he left on his voyage. The monastery was built in 1502 by King Manuel I to commemorate that voyage. Da Gama's tomb is inside. The flamboyant style of this building is called Manueline style after the King that built it. It froths with motifs from the sea in a combination of late Gothic and early Renaissance styles. ...It became a place where later sailors would spend their last night here in prayer before embarking on voyages of discovery. The Cloisters inside are beautiful; its columns decorated again with ornate sea motifs. But you've got to admit, this small white tower is as picturesque as it comes. This little fortress is also built in that Manueline style. This exuberant style along with it's small size just makes me think cute, but it was a serious fort. Now it's often used as a symbol of the country. 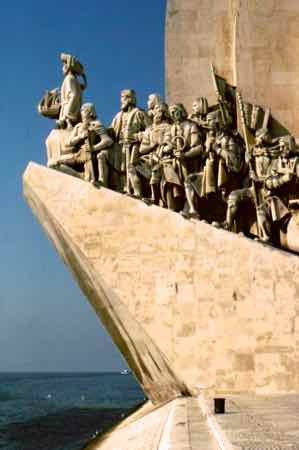 The Monument to the Discoveries (Padrao dos Descobrimentos) is a "new monument". with all the important navigators of Portugal represented on it. It was built in 1960 to commemorate the 500th anniversary of the death of Prince Henry the Navigator. Also visit the Ajuda Palace (Palacio da Ajuda), an extravagant royal palace, filled with furniture, tapestries, and statues. 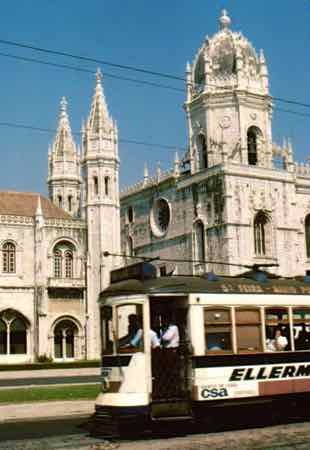 The nearby Belem Palace was built starting in the 16th century. It is now the official residence of the President of Portugal, so it can be visited only on Saturdays to see its richly furnished halls. Don't miss the Coaches Museum (Museu dos Coches) which is part of the Belem Palace. Visits to this part of the palace are not restricted to Saturdays. It has one of the largest collections of ornate coaches in the world. Those richly decorated coaches really are fun to see. All of these sites are within easy walking distance of each other. There are many cafes in the area. Most of the guidebooks will tell you that the best places for a drink and pastries (especially their custard tarts) are the Antiga Confeitaria or the Casa Pasteis. We agree either is worth a stop, just be aware that you won't be the only tourist there. Plan to spend at least one full day in this historic district, but don't plan your visit for a Monday. That's the day when many of the sites are closed. Any other day of the week, it will round out your visit to Lisbon.